Homeowners Daniel and Vangie Peppers’ interior design tastes are about as different as night and day. Daniel explains, “My personal style has eclectic chaos. Fortunately, my wife prefers more elegance and quiet.” Their home, set on the banks of Lake Washington in Seattle, reflects a harmony of both styles. This is evident in simple things, like vibrant artwork displayed against walls of subtle and cream-colored neutrals and a state-of-the-art kitchen with features such as high end appliances, featuring a traditional area rug. Vangie Pepper had a vision and a Pinterest board long before she ever had the collaborative dream team who would make her design vision a reality. “Even before Pinterest she had folders — one would be labeled powder room; one would be kitchen,” Daniel says of his wife. She brought the Pinterest collection to designer Lisa Staton at the start of the project. “If you look at all the pins (images) as a whole, you can get a strong insight into the essence or emotion that a client is striving to have in their home,” Staton said. Staton used the images as a basis for inspiration, and to identify the overall look and feel the clients were seeking for their home. She then worked with architect Tim Hossner, of RHO Architects, to translate the mood and style of the images into the revamped spaces and tangible textures, colors, patterns, and furnishings of real life. To achieve unity, the architect strategically positioned the living and dining rooms of the home so that they overlooked the water on one side and opened up to a courtyard on the other. This placement allowed for a plethora of natural light to pour into the space, which accented the floor to ceiling aluminum clad windows, and exposed naturally occurring steel and wooden beams. Once the layout and floorplan was established, Staton had the perfect foundation from which to execute the Peppers’ vision. When looking at the homeowner’s Pinterest board, she noted that they favored open concept spaces and light color palettes with strong European influences. She began with the walls, sticking to creamy tones which honored the light, airy feel the homeowners were seeking. She chose to texture the space with complimentary natural materials: carefully selected sisals and linens. “It was actually as much about texture as color,” she recalls. She then fused the modern, bright and open spaces with old world antiquities and select furnishings for a distinctive, one-of-a-kind design. “If I had to give this project a name I’d say Relaxed-Modern-Mediterranean,” Staton says when describing the lakefront home. “It was really very diverse stuff,” Hossner, of RHO Architects agreed. “Modern, traditional and everything in between. But to me, it all had the feel of being very tailored and crafted.” This juxtaposition is evident in the contrast of select pieces throughout the home. The powder room hosts a magnificent 100-year-old Turkish sink outfitted with steel legs, designed by RHO, and set against the contemporary teardrop-shaped pendant lights, selected by Staton. The living room boasts sleek leather sofas contrasted by an antique Chinese bench repurposed as a coffee table. “It was a perfect alchemy, just the right push and pull of modern and traditional,” Staton reminisces. In sync with Modern-Traditional design, the homeowners knew the flooring choice was a critical decision that would dramatically impact the overall look and feel of their home and they wanted to get it right. “There are parts of the home that you’re not going to change and they’re a big deal. Floors are definitely right at the top of that list,” Daniel stated. When it came to taking the plunge and make the ultimate selection, the couple chose to go with a Walnut wide plank floor from Carlisle. The 10-inch-wide hardwood drastically reduced the number of noticeable seams and allowed the floor to flow easily from room to room. It blended seamlessly with the overall design and provided far less visual distraction, unlike homes with floors made from narrow planks. Traditional in look and feel, the naturally warm Walnut is balanced by both the width and length of the planks, which are ideal for homes with contemporary, open-concept floorplans. The Peppers, RHO Architects and Lisa Staton Design were able to create a beautiful, harmonious design by choosing to craft their wide plank floor with Carlisle. Sarah Diaz, Wide Plank Specialist, had the honor of working on the Peppers project. “One of the things I love about working at Carlisle is that all of our floors are made to order. So I get to help my customers choose what type of wood makes the most sense for their home. We talk about what type of character they’d like to see in the floor. We talk about whether they’d like to see a texture in the floor or a special finish. We have an ability to customize that’s really special and unique for the wood flooring industry,” she says. 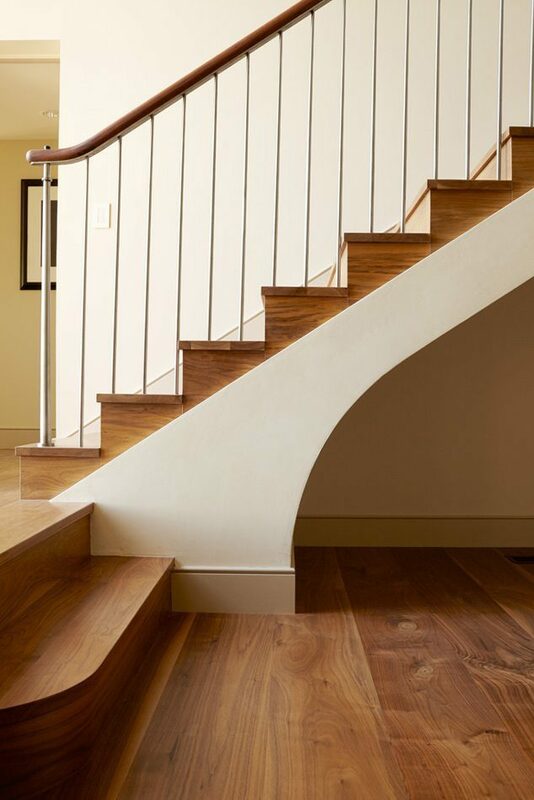 For over half a century Carlisle has been working with clients all over the world to create one-of-a-kind custom-crafted floors in just the right style, species and color — all built to individual specifications. If you’re seeking for a unique floor that will compliment your space or serve as a beautiful focal point for your home, consider Carlisle. Contact us today to speak with a Carlisle Wide Plank Specialist for a complimentary design consultation or to order custom samples.